Three episodes in and still going strong. And various pieces of the overall plot arc - Professor Jaggat and Kemp versus the supernaturals - spectacularly spring into focus by the end of this episode. Whilst Mitchell gets unwillingly dragged into the 'sturm und drang' of the power vacuum in the 'vampire community' by the coquettish Daisy, George and Annie decide to do a bit of matchmaking with Hugh and his former girlfriend Kirsty. How well these two sub-plots work and how comfortably they sit beside each other is down to personal taste I would think. Personally, after two episodes full of jet-black story development it was good to bring in a bit of a light touch. Splendidly, George and Annie as romantic matchmakers works well and, more importantly, forms one of the comic reversals of the episode. 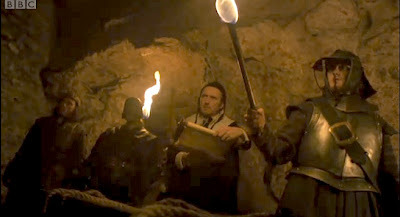 There is the cod-Pythonesque flashback to Bristol of 1665, complete with a Catholic priest asking for a bit more light as he condemns a hidden coven of vampires ('that's much better') to eternal damnation or nonchalantly asking about which order they should be destroyed in ('Should we start with the infants?') and checking his paperwork as vampires get their teeth smashed in. This then is later reversed in what is one of the harshest scenes in the episode where Mitchell must prove he means business to the chaotic group of vampires adrift in the city by punishing the errant Cara by similarly bashing her canines from her mouth. Oh, Mitchell, what have you become! Mitchell is, of course, under pressure to sort the vampires out now that the system put in place by Herrick begins to fail and vampire murders start to turn up on a regular basis in A&E. 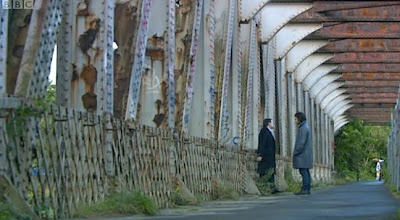 Not only does this peak the interest of Lucy, the doctor that Mitchell has formed an attachment to, but it also throws light on the 'system', revealing not only the pathologist Quinn in the employ of both the police and Herrick but also the deal Herrick had with DCI Wilson who sees the vampires as a neat way to keep the crime figures down. The results of his renewed pact with Mitchell are truly shocking as they move in and murder the surviving murder victim Marcus, cover their tracks by signing reports and burning statements. What's also interesting here is that the murders are discovered or take place in daylight, emphasising that the vampires are moving about in full view with no desire to cover their tracks. This affords director Colin Teague an opportunity to use Bristol landscapes well and further develop the series visual qualities. There are great uses of the dock areas and industrial spaces as well as the interior of an abandoned church. 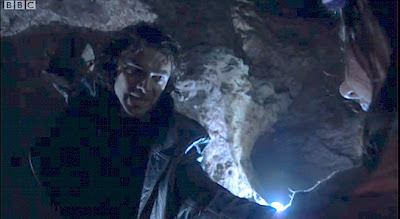 Mitchell must restore order and the episode charts his journey towards his reluctantly being crowned 'king' of the vampires, beginning with his imagining pulling the plug on victim Marcus and having his human-like relationships with George and Annie diminishing as a result and the potential of partnering up with Lucy no longer a possibility. This is both tragically and comically displayed - Mitchell's advice to George that he must take responsibility for himself now, a breaking of the bonds that hold them together, is contrasted nicely with the hilarious rant about The Real Hustle being bumped around the BBC3 schedules. A right pain if you've just come in having tried to get vampire society back on track, followed by nagging from your housemates about not doing the washing up. Marigolds ahoy! The relationship with Lucy has a certain cynical philosophical edge to it. As Mitchell tries to cover up his intentions for Marcus with a bit of preying they engage in some witty banter about the nature of faith. Lucy remarks she's never seen the last minute appeal to God manifested in a porter before. "I suppose the bad working conditions have driven you to believe in a monotheist deity?" "That's what happens when you haven't got a strong trade union," retorts Mitchell. "I blame Thatcher," she replies. This is all put into perspective when Lucy's true identity is revealed at the end of the episode and we can pretty much surmise that all her work banter has been an act from day one. Meanwhile George and Annie decide that the best way to help out Hugh, who has been looking for Annie and now can no longer see her after her near-death encounter with the death door, is to get him back with his former girlfriend Kirsty. Annie convinces George to become Kirsty's worst ever boyfriend in order to send her running back to Hugh. His plan to take her to a three hour German art house film followed by a kebab completely backfires and he realises that he will need to take the direct approach with Kirsty and remind her that there are always second chances. Even if his own chances with Nina look exhausted. It's a beautifully written and played sequence, reminding us of much of the humour of the first series. Russell Tovey and Lenora Crichlow have natural comic abilities and are delightful. When this includes Mitchell and Hugh, it also explores how men tend to do practical things, such as getting drunk, to discuss their problems whilst women tend to want to explore issues emotionally, diplomatically. But humour, albeit of a darker variety, permeates the downward spiral of Mitchell. 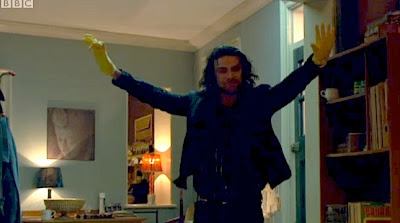 Cara's recital of Winehouse's 'Rehab' as he asks the vampires to get on the wagon is hilarious. Wilson's request for money in his conversation with Mitchell on the bridge is justified by the fact that he has "an extension to finish and not to mention the wife's bloody eBay habit". Kirsty does get back together with Hugh but the reversal here is that Annie is once again alone and George receives a devastatingly final phone call from Nina. Tovey and Sinead Keenan absolutely break your heart as Nina and George say their final words. There's a beautiful section of incidental music that helps deliver the emotional punch of the scene too. Let's hope they aren't that final because as that scene reveals, Nina is in the clutches of Kemp and...Professor Lucy Jaggat. Eek! What a twist! A brilliant episode. The series keeps getting better and better.